Xavier-Luc Duval, Acting Prime Minister of Mauritius, visited Mahamandaleshwar Sri Swami Vishwananda on the evening of 27 February 2016, in the country’s capital Port-Louis, to receive his Darshan (blessing). The fourth and final Darshan concluded the Mauritius tour 18-28 February 2016, in which well over 1’000 individuals from across the country met with the fully realised master. 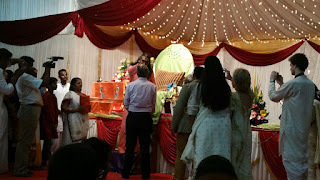 Mauritius is Sri Swami Vishwananda’s native country. He spent his youth there before he left for Europe in 1998 to launch his international mission, which is now active in over 50 countries under the name of “Bhakti Marga” (Sanskrit: “Bhakti” means devotion, “Marga” means path). Sri Swami Vishwananda’s main message and teaching is simply “Just Love” and the goal of his mission is to open the hearts of Man to the Love of God, irrespective of religious, cultural or social backgrounds. Paramahamsa Sri Swami Vishwananda is an enlightened spiritual master and the founder of the Bhakti Marga movement, the path of devotion. Paramahamsa Vishwananda travels the world to convey the message of universal Divine Love, changing thousands of lives in the process. Paramahamsa Vishwananda inspires us to open our hearts to Divine Love, teaching us to go beyond the boundaries of religions to experience the all-connecting essence that is JUST LOVE.